The Boston area suddenly has transitioned to the winter holiday season. This Saturday, the store parking lots are jammed, as people prepare for Christmas and Hanukkah. Many cars have Christmas trees lashed on top. There’s been some snow, and walkways at times have patches of black ice. Outside, there’s a near-constant smell of smoke from invisible fireplaces in the neighborhood. The air is chilly. We bought our tree this afternoon, and so, the house is redolent with the scent of pine. Some of our children are singing Christmas carols. Even though it’s cold, about an hour’s drive away, there’s a secret river spot for me. 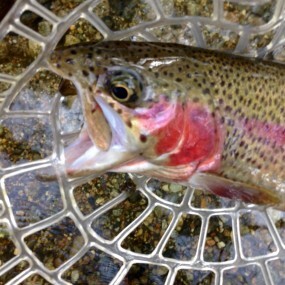 I can fish and get home without too much ado. 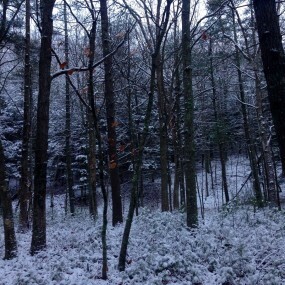 And, there, in the middle of thick woods and snow-covered trails, is my version of paradise in a winter wonderland. A good weekend to you all….